This 30,000-square-foot, LEED certified medical office building is located off the Byron Center Avenue exit of the M-6 Freeway, in Wyoming, Michigan, within the Metro Health Village, and resides on approximately 2.5 acres at the corner of Center Drive and Health Drive. This building is modeled after one of The Granger Group’s award-winning design prototypes, where it has proven its ability to be a flexible, as well as a satisfying and productive work environment. 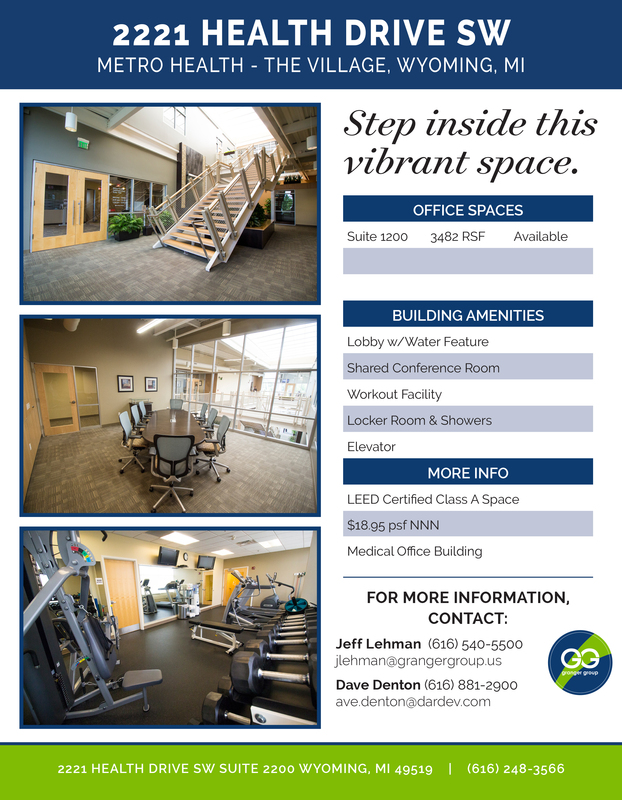 Download Brochure Tenant amenities include a shared conference area and fitness center, complete with locker rooms and shower facilities. Economic benefits are achieved through use of radiant heat, workspace occupancy light sensors and the introduction of natural daylight.